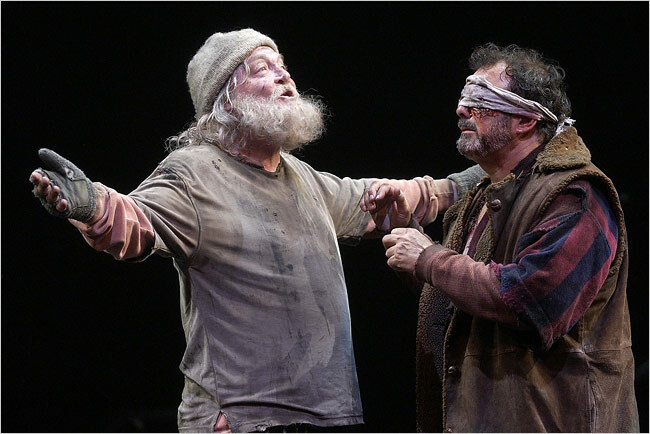 Stacy Keach as King Lear at Chicago's Goodman Theatre. Without even getting into the idiosyncratic particulars of Bob Falls' Lear, I find this image powerful on its own. Only the recongizability of modern urban "homelessness" can really capture the heath scene anymore, I feel. I recommend Charles Isherwood's vivid account of the production. Falls' vision for the play does seem bold and compelling, whatever the complaints of excess. Shock tactics, yes. But one of Mr. Falls’s aims is to reawaken our revulsion at the violence in this relentlessly dark tragedy. You could argue that this isn’t necessary in a play that famously features an onstage eyeball-gouging. Yet even in most modern dress productions that brutal act has an otherworldly horror; here it is underscored as part of the larger pattern of brutal violence pervading the play. Mr. Falls’s attention to the gruesome specifics of violation rips the distancing trimmings off Shakespeare’s bleak vision of humanity destroying itself; each shaft of a knife, each shot of a gun tells.